I think I came this way to write and share my mind with the world. It’s what I do, and enjoy most in life. What about you? As for the picture above, I love the Peanuts comic strips and related anything brought to life by Charles Schulz. Especially, Charlie Brown. Everything about Charlie Brown is wonderful, easy to relate. He is an emphatic symbol for all who strive, and keep going no matter the result. Throughout and afterwards of his own actions – we find questions, explorations, reflections not just in our favorite blockhead, but in ourselves. Charlie Brown’s conclusions are often humorous, and understanding. We learn from him, to best enjoy and perhaps appreciate our little failures in life, at least for a chuckle. Then, we find other reasons to smile, often the less complicated life things work best, like peanut butter sandwiches and funny dogs. Concerning the above picture: I love the transitional flipping of black and white. This adds much more to the message and conclusive question. 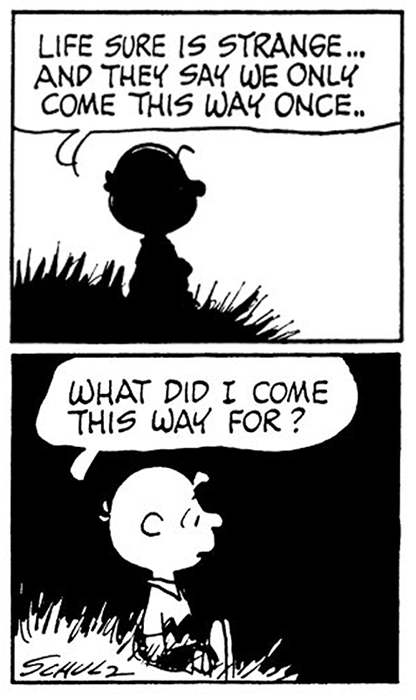 As a result, I feel Charlie Brown may have pondered this for a while. The differences in time between panels could have been minutes or days, perhaps years; I think it’s all the same. As to what leads him to this rumination process, we could only imagine. Losing another baseball game? Another awkward encounter with the Little-Red Haired Girl? Another 5-cent psychiatric evaluation with Lucy Van Pelt? Or perhaps, nothing at all.. I know not the original source of the above picture. The pic was on my hard drive for a long time and forgotten until now. I felt it needed sharing. If anyone knows more info: including the original printed platform, publication date, additional context; please share. Posted on April 4, 2013 by Orion T.	This entry was posted in Uncategorized and tagged Charles Schulz, Charlie Brown, comics, life, Peanuts, philosophy. Bookmark the permalink. Thanks for sharing this. I think your writings are very good! !